PERFECT PELARGONIUMS: Angel Pelargonium "Billie Barnes"
I have very few Angel Pelargoniums just now, but of the few I do have "Billie Barnes" is one of my favourites. Raised by Jim Zemcik, USA. The flowers have three lower petals of white with very pale feathering, and the top petals are a deep pink lightly edged with white. I find this has a lax growing habit, which makes it ideal for a hanging pot. The latest magazine, Pelargonium & Geranium News, from The Pelargonium & Geranium Society, has now been published. This edition features articles by Ursula Key-Davis of Fibrex Nurseries on growing Ivy Leaf Pelargoniums. Another interesting article by Fibrex Nurseries is about Genetics. 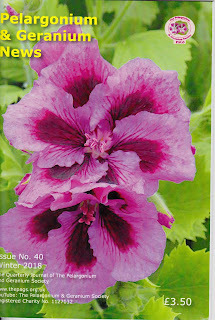 Plus articles about Regal pelargonium hybridist Nicola Stemp, and a member tells us how he grows his pelargoniums 'cold'.